DUAL TECHNOLOGY, CHEMICAL PEEL & MICRO EXFOLIATOR: perfect balance between mild chemical peel with AHAs and a mechanical micro exfoliator using ocean-friendly beads. Optimum skin renewal benefits for face and body. Gentle enough for face yet not too mild for body. UNIQUE LCA COMPLEX: offers superior moisturization, multi-layer skin renewal and antioxidant protection with 4 vitamins skin essential antioxidants Vitamins A, C, E & ProVit A.
AT-HOME MICRO DERM: effective exfoliator treatment to use 1-2 times per week, all skin types except highly sensitive or open skin. Fabulous also for pre-tanning, manicures, pedicures and to assist in peel protocols. 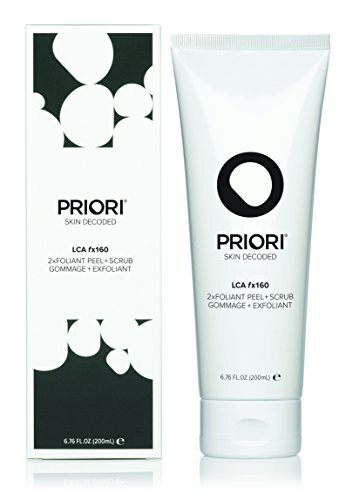 WE STAND BY OUR PRODUCTS: you can buy with confidence with Priori Skincare - official Priori account. We use the latest technology with cutting edge ingredients to deliver advanced skincare with clinically proven results. 2xfoliant Peel + Scrub is cruelty free, free of parabens and proudly made in the USA. 100% satisfaction guaranteed or money back within 30 days no questions asked. Your complete satisfaction is our priority! If you have any questions about this product by Priori, contact us by completing and submitting the form below. If you are looking for a specif part number, please include it with your message.